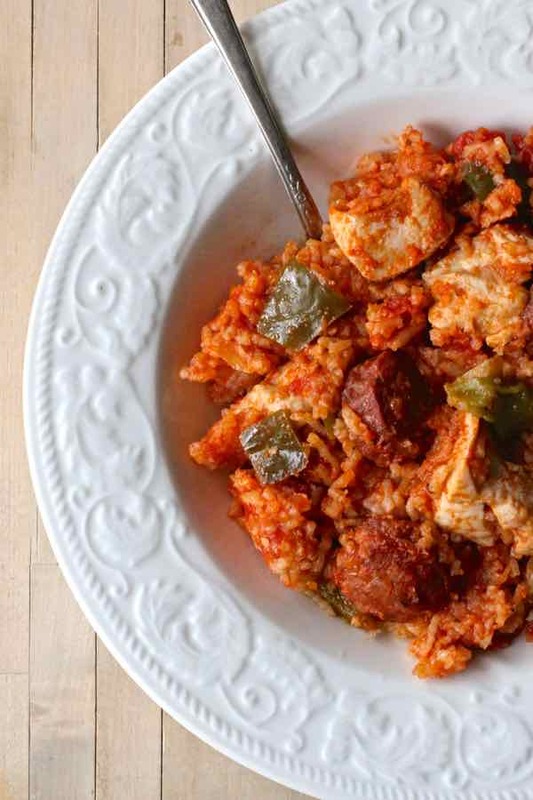 Jambalaya is probably one of the most emblematic dishes of Louisiana! Jambalaya is a one-pot meal composed of meat and vegetables that are mixed with rice. Traditionally, it includes smoked sausage like andouille, mixed with other meat or seafood, including chicken, pork, crawfish, or shrimp. 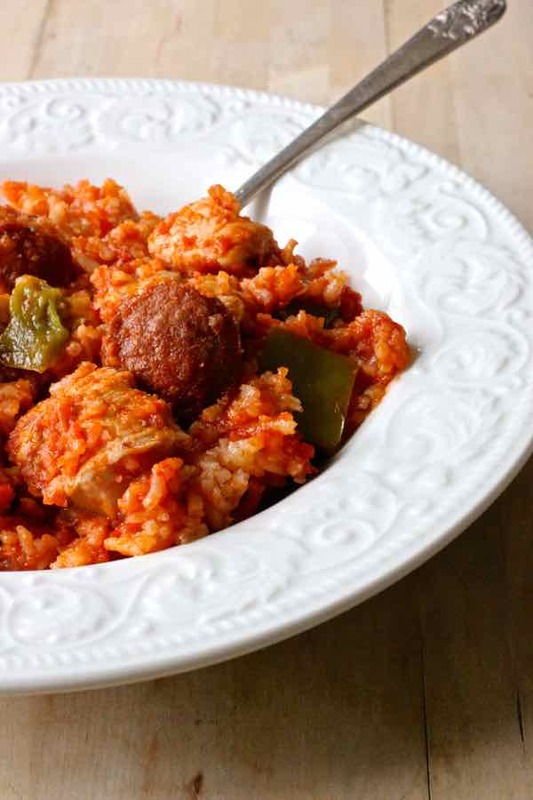 Louisiana has historically been influenced by several peoples and cultures, all of whom claim a role in the paternity of the jambalaya recipe. Indeed, this iconic dish of the South is thought to have been influenced by the Spaniards, French, Creoles, Cajuns, as well as Africans. What is the origin of jambalaya? The origin of the name of the dish itself is subject to controversy. One common theory states that jambalaya is a combination of the French word “jambon” (ham), and “aya” which would mean rice in a West African dialect, leading to “jamb a l’aya”. 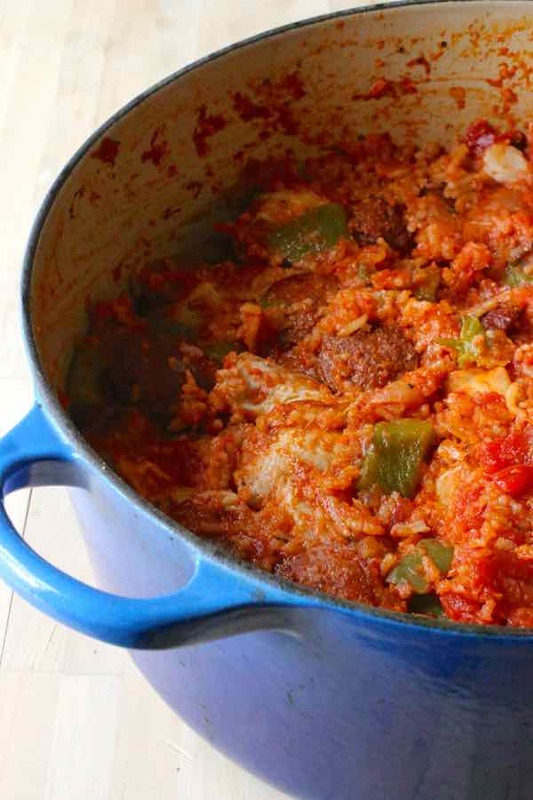 Another possible origin is that the word ‘jambalaya’ is based on the Provençal word “jambalaia”, which has appeared in a French-Provençal dictionary in 1878, but had first been used in a Provençal poem in 1837 (Leis amours de Vanus, by Fourtunat Chailan). The word means mishmash, much like the dish itself. 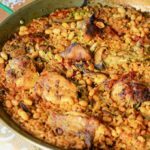 Yet another popular story suggests that the word jambalaya comes from the Spanish word ‘jamón’ (“ham”) associated with paella. However, this story doesn’t seem to have legs, as ham is not an ingredient of the traditional recipe, and Spanish speakers would say ‘paella con jamón’ as opposed to jamón paella. Still, it is believed that jambalaya was an attempt to recreate saffron-scented paella using New World ingredients like tomato. The earliest jambalaya recipe also called for a type of sausage called chaurice, a version of Spanish chorizo. A far-fetched theory comes from on the story of a traveller who was staying in an old guesthouse in Louisiana. One night, he asked the cook named Jean to “sweep something together” in French. “Jean, balayez!” would eventually become ‘jambalaya’. 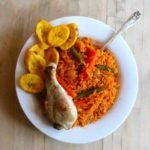 What is certain is that the authentic jambalaya recipe has benefited from the influences of various similar rice dishes including paella (Spanish), jambalaia (French provençal) or jollof (West African). Jambalaya is also similar to other Louisianan staples such as gumbo or étouffé. Gumbo is very similar to jambalaya, with the exception that the stewed meat and vegetables are typically served over white rice and that the dish includes filé powder and okra. Filé powder is a spice made from the dried and ground leaves of the North American sassafras tree. Étouffée, on the other hand, is a stew which always includes shellfish, often crayfish. Like gumbo, it is usually served over separately prepared white rice. 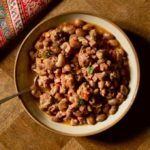 Hoppin’ John is also a traditional rice dish from Louisiana, that is mostly composed of black-eyed peas, onions and bacon. There are two primary methods for making an authentic jambalaya recipe, primarily differentiated by the presence of tomatoes. The first method called Creole jambalaya or “red jambalaya”, obviously includes tomatoes. 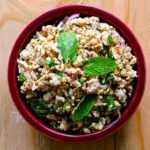 The second method, which is more traditional of southwestern and south-central Louisiana, is called Cajun jambalaya, or brown jambalaya and doesn’t contain any tomato. Creole jambalaya originated in the French Quarter of New Orleans. As stated earlier, it was an attempt to make paella without saffron which was available. Tomatoes became the substitute for saffron. This creole version is primarily found in and around New Orleans. Cajun jambalaya comes from Louisiana’s rural, low-lying swamp country. In this region, crawfish, shrimps, oysters, alligators, ducks, turtles, boars and venisons are plentiful and these are the traditional meats being used in Cajun jambalaya. 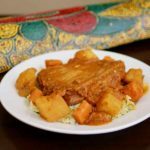 This version is also known as “brown jambalaya” as the meats, typically browned at the bottom of a cast-iron pot, give this jambalaya its particular color. The Cajun people descend from a group of French Canadians who were expelled from the former French colony Acadia (Eastern Canada) in the late 18th century, and settled in Louisiana’s low-lying swamps. Cajun cuisine is considered rough and robust. It is often characterized by dark roux, very spicy flavors. It also often includes large amounts of animal fat. 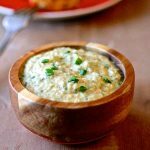 Creole cuisine tends to be more refined with the use of ingredients like cream and butter. I chose to make the creole jambalaya version, as I didn’t really have access to alligators or turtles around home! Jambalaya is definitely a hearty and comforting dish that we enjoyed last Sunday, but also Monday and Tuesday, as I doubled the recipe! I went to New Orleans three times, and always had a great time. The first time was in 2002. I had the chance to visit bayous, plantations, and rural regions of Louisiana as I drove all the way from New Orleans to Houston, with a few stops along the way, including other cities like Baton Rouge, Lafayette, or even Gonzales, declared jambalaya capital of the world in 1968. A road trip that allowed me to appreciate the cajun and creole cultural heritage of Louisiana. I can’t wait to go back and enjoy authentic jambalaya with the kids! 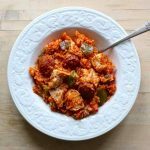 In the meantime, join me in preparing this very easy jambalaya recipe at home and you will feel transported to the French Quarter! Jambalaya is a delicious traditional one-pot meal from Louisiana that is composed of rice mixed with vegetables and meat or seafood. Heat the oil in a Dutch oven. Add the onion, bell pepper and celery and sauté for 8 to 10 minutes. Add garlic and sauté for 2 minutes. Add sausage and chicken and cook for about 10 minutes. Add tomatoes, tomato sauce, bay leaves, broth, Creole seasoning and rice. Cover and simmer on low heat for about 40 minutes.